I'm thrilled to share that my Alphabet-a-Day Project is online! 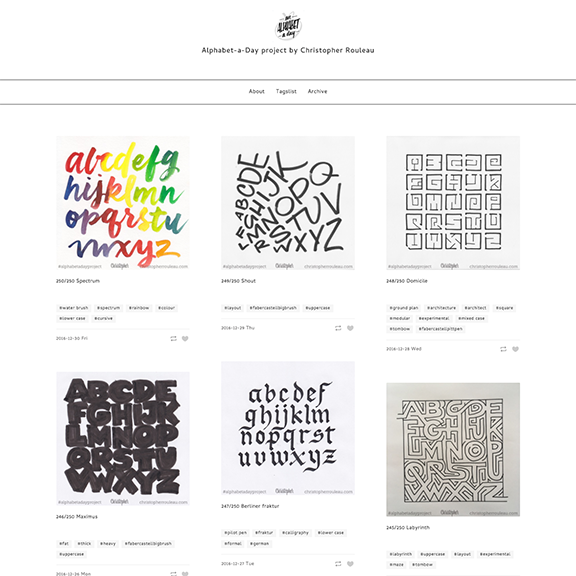 All 250 alphabets are archived and fully searchable by pen type, case and style. Which is your favourite? I would agree with the general consensus was that 2016 was a challenging year for most people, myself included. I am so grateful for the support of friends, family and my community. As in previous years (2011, 2012, 2013, 2014, 2015), here is my annual recap of how my year unfolded. In January, I started my most ambitious lettering project to date: Alphabet-a-day, where I set out to hand-letter one complete alphabet each weekday of 2016. I also had a small illustration of my favourite numeral published in UPPERCASE Magazine. February was busy with client work, but I took time to release 4 free downloadable Valentine cards! Among other client projects in March, I had fun doing a logo refresh for Pocket Concerts. I also taught a Ligatures brush pen workshop at Shopify, and spoke about vernacular typography at Humber College. In April, I zipped over to Calgary to teach a brush lettering workshop at UPPERCASE Magazine. The magazine also released its new issue, featuring my interview with Penguin UK book designer, Coralie Bickford-Smith. Two exciting lettering projects were revealed: a hand-lettered wordmark for Jane 100 (celebrating the work of Toronto urban activist, Jane Jacobs), and custom lettering for Seattle-based music Erik Blood's new album, Lost is Slow Motion. May was super busy with client work, and preparing the launch of my new 2016/2017 collection. And, I settled into my first studio space, and started doing small lettering videos. In June, my collection was previewed at the first ever Pixel & Bristle design market, which I co-organized with colleagues Margot Trudell and Marta Ryczko. It was a blast! July marked three fun lettering projects (coincidentally, all in Toronto's east end! ): a massive custom chalkboard for Wonder Pens, custom lettering decals for BRIKA store, and a hand-painted sign for the new French restaurant, Greta Solomon's. 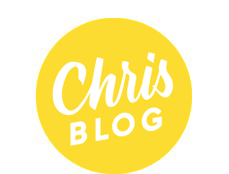 Also this little blog turned 10 years old! In August, I launched three new hand-lettered products in the Ligatures shop. September was pretty epic! After months of preparation, I made my 2016/2017 collection live on my new online shop and Etsy store, including 16 prints, a clock and my perpetual Calendar, with its own fancy microsite. Thanks again to my talented developer, Chris Roberts, for his help! Then, it was off to Calgary to teach another brush lettering workshop at UPPERCASE Magazine. And at the end of the month, quite unexpectedly, I was invited to join Candy Palamater on CBC Radio q to chat about the future of handwriting. You can listen to the interview here. In October, UPPERCASE issue 31 was released which featured not one, but TWO, articles about design for the performing arts. The first was with Ireland film graphic designer, Annie Atkins. And the other was with Toronto-based theatre set & costume designer, Michael Gianfrancesco. In November, I eagerly attended RGD DesignThinkers conference as the roving reporter for UPPERCASE Magazine. You can check out my recaps here and here. As well, my It gets better / It gets worse paintings were featured in Swash & Serif group typography show, as well as the Buddies in Bad Times Art Attack auction, which raises money to support Canada's best LGBT theatre. And then, just in time for the Pixel & Bristle holiday market at the Drake Hotel, I unveiled my 2016 limited edition holiday cards. And then it was December! I co-instructed a Ligatures brush lettering at Klick Health, and then capped the year off with Toronto's best holiday market, City of Craft. It was so much fun - a great, celebratory culmination of the year. 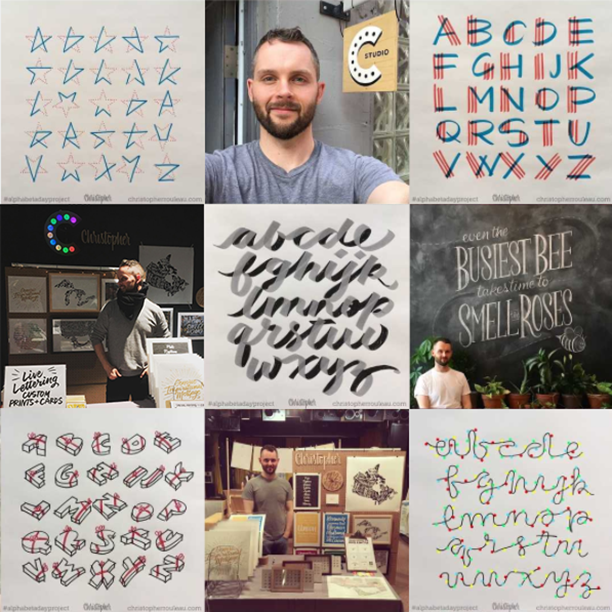 This year wouldn't have been possible without the support of YOU – those who purchased a print from my shop, liked one of my Instagram photos, attended a workshop, or visited my booth at City of Craft. I am endlessly grateful to continue doing work that I love. May 2017 bring you peace and happiness in this ever-changing world.